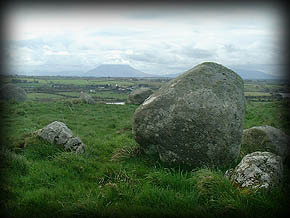 On a small hill one kilometre North of Rathfran Friary lie two stone circles, the first of these circles pictured left, consists of thirteen boulders of various shapes and size, and is approximately fifteen metres in diameter. When I approached the circle it was quite dull and cloudy, as can be seen from the pics but before I had left the sun had come out and the circle suddenly appeared to come alive. 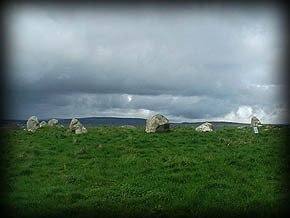 The second and smaller of the circles in this beautiful location lies South of the main circle in a neighbouring field, consisting of seven to ten stones this circle has been somewhat disturbed and appears to look like field clearance. this circle lies on a slightly raised platform, see picture below. 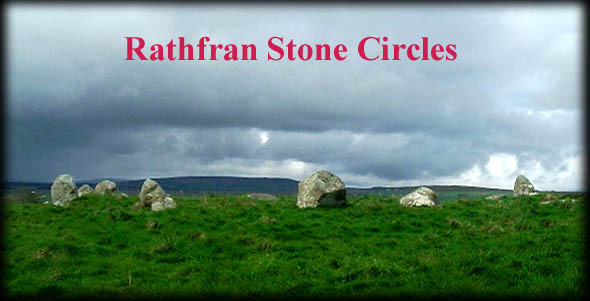 These circles are well worth a visit for the views alone. 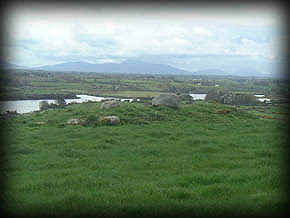 Situated: From Ballina go North through Killala, take a right after you cross Palmerstown bridge then take another right at the first crossroads, the road takes a sharp left after 600 metres, about 300 metres after the bend there is a lane to your left, go to the top of the hill and the circles are through the gate on your left. Discovery Map 24: G 1916 3349. Last visit April 2004.